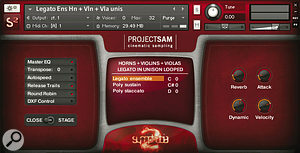 The success of Project SAM's Symphobia is founded on a simple fact: many users lack the time, patience or know‑how to painstakingly build sampled orchestral arrangements one instrument at a time, and so appreciate a library that features full, ready‑to‑play strings, brass and woodwind family sections as well as ensembles of different instruments playing together. Add to that Symphobia's impressive array of hits, rips, clusters and glissandi and its large soundscapes section, and the net result is a powerful, impressionistic and easy‑to‑use orchestral collection that was well received across the board. 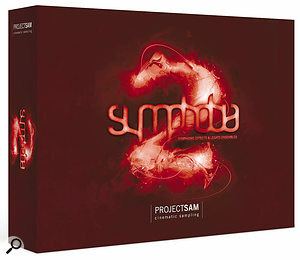 Symphobia 2 is formatted for Native Instruments' Kontakt 4.1 sampler, which runs stand‑alone and as a plug‑in on Windows and Mac machines. Kontakt Player 4 software (which doesn't allow editing) is included on the installation DVDs — but if you already own the full version of Kontakt 4.1, you won't need this player (in fact, if the installation software detects the full version of the program residing on your system, it won't install it anyway!). Thanks to Kontakt's new lossless compression method, the 33GB of 24‑bit sample data occupies only 18.2GB of disk space when installed. In Symphobia 2's 'Dystopia' section, the mod wheel can be used to apply extreme filter settings to the processed soundscapes. Since the 'all together now' instrumental approach of the original went down so well, Symphobia 2 offers a lot more material in the same vein. The producers go straight for the jugular with a powerful 'full orchestrator' patch containing strings, brass and woodwinds playing together. With this, you can keyswitch between splendidly forceful and meaty staccatos, looped sustains and a set of long notes in which higher instruments double the bass notes across four consecutive octaves. An optional, additional grandiose timp-roll layer makes these octave samples ideal for the final, triumphant note of your latest orchestral masterpiece. Then again, if you'd rather end on a big fat tutti major or minor chord, there are plenty of them in the library too. Much as I enjoyed the lively staccatos of the combined strings and woodwinds patch, I initially found the woodwind element hard to detect — because the loud, emphatic strings bow attack (a Symphobia trademark) tends to mask it. Further listening revealed a bass clarinet in the low register and a trace of an oboe higher up. Though the wind instruments' contribution appears subliminal, you'll notice a marked difference in tone if you compare this sound to a strings‑only patch. On a less subtle note, you won't have any difficulty hearing the bright, perky xylophone the producers recorded playing along with violins and woodwinds, an inspired touch that has created a unique and colourful orchestral timbre. A new set of full string section articulations complements those in the original Symphobia: these include energetic and bouncy short spiccatos optimised for film action scenes, trills and a set of beautifully played, emotive and precisely co‑ordinated crescendo‑diminuendo swells. Unison sustains from the original Symphobia are also included, but there are no full string-section pizzicatos. I greatly enjoyed the 'grace note performer' patch played by unison violins and violas: urgent, emphatic short staccatos that mutate into semitone grace notes when played loud, supported in the bass by massively powerful tutti staccato stabs. This creates instant orchestral drama — and I could jam for hours with this sound. The octave cellos and basses are also very good, and absolutely nail the threatening, low‑strings grumble that says to audiences 'something bad is about to happen'. 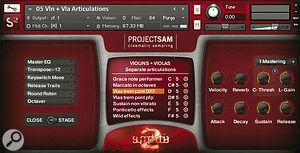 SAM built their reputation on orchestral brass samples, and the selection here maintains their usual high standard: eight French horns performing sustains whose fierce attack can be attenuated with the mod wheel, powerful staccatos, semitone trills (reminiscent of a swarm of aggrieved giant bees) and some real‑life, deliberately discordant pitch‑bends, in which notes start off in unison and gradually drift apart. The higher brass is represented by three trumpets playing long notes in clean, well‑tuned octaves. Though this is by no means a comprehensive brass collection, its strong, commanding tones are fit to summon an emperor. 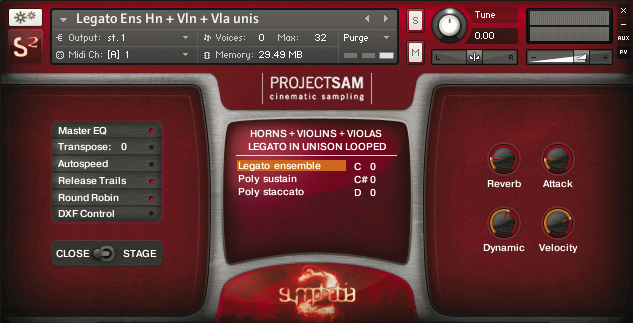 Project SAM's interval‑based legato sampling for mixed ensembles is an industry first. I was pleased to see that in this library SAM have, for the first time, implemented interval‑based legato sampling for some instruments, recording all up-and-down chromatic scale steps up to an octave. Pioneered by Vienna Symphonic Library in 2003, this technique has become increasingly common in orchestral libraries, but I believe this is the first time it's been applied to mixed ensembles. The results sound excellent, and the instrumental pairings chosen for the legatos are delectable: two flutes and a clarinet sound sweet, smooth and lyrical, while the oily, villainous low‑end octaves of a bass clarinet and contrabassoon duo positively scream 'baddie!' I liked the melancholy sound of cellos and solo bassoon, though once again the woodwind element is a little overwhelmed by the strings. When it comes to orchestrating John Williams‑esque, uplifting, melodic motifs, you've a choice of unison French horns and trombones, or a superb violins, violas and horns patch. In a more intimate vein, I found both the solo flute and solo French horn legatos to be agreeably liquid‑sounding, and the folksy slides and gracings of the Irish low whistle and Uilleann pipes are also very playable, as long as you remember they're only mapped to the notes of the D‑major scale! For speed of access, Symphobia 2 presents all articulations played by each instrument or section in one keyswitchable patch. His Fabness Sir Beatle Paul, referring to the improvised ascending orchestral cacophony in 'A Day In The Life', said, "The strings were like sheep — they all looked at each other: 'Are you going up? '” In the Symphobia series, the string players are not sheep — they're wolves. In the 'wild rips' section, they lead the rest of the orchestra in a series of uproarious, cataclysmic swoops before turning round and devouring the woodwind section. The brass players sound equally psychotic, contributing nasty, low‑pitched snarls over scary, atonal chords and dissonant crescendos that drip with menace. 'Symphobian Stacks' sees multiple musical effects layered over orchestral bass drums, piatti cymbals and a low octave of synth-bass swells to devastating effect; one particularly intense sonic event starts off sounding like a distant fly‑by of Alpha Centaurian attack craft before crossfading with a long, massive, detuned, subsonic gong‑and‑orchestra crescendo rumble. Do not play these samples to young children. Like all SAM libraries, Symphobia 2 presents its samples in a choice of mic positions, in this case 'stage' and 'close'. Both contain traces of the concert hall reverb; when you load an instrument, both mikings are immediately available, selectable by a switch on the front panel. The Kontakt GUI gives instant access to important parameters such as EQ, ADSR envelope settings, and an effects menu that includes convolution reverb, delay, stereo spreader, compression and a resonant filter. Added to the extensive keyswitching facilities, such a wealth of features renders the distinction between sound library and virtual instrument almost entirely academic. The only minor criticisms I have of this library are firstly that some instrument ranges seem somewhat curtailed, and secondly that the liberal mixing and matching of unisons and octaves within tutti patches occasionally caused me problems. For example, I found it disconcerting that the high register of the 'full orchestrator' unisons suddenly sprouts an upper octave of trumpets when played loud. The saving grace is that the programming is always designed to make the sound bigger and more dramatic, which is, after all, what most media composers want. Symphobia 2 doesn't set out to cover every instrument and articulation under the sun, and thus would not be a good choice for recreating all the pointillistic detail and subtle gestures of a full orchestral score. What you get instead is orchestral samples with attitude, presented in instantly playable sections that can be a great inspiration for composing. It's safe to say that most users will find something they really enjoy in this large collection — and if absolutely nothing in it stirs you, it might be advisable to consider an alternative career in accountancy. You'll find excellent individual strings, brass and woodwind ensembles in Vienna Symphonic Library and EastWest Quantum Leap Symphonic Orchestra — however, you won't hear them all playing together in various combinations, as they do in Symphobia 2. 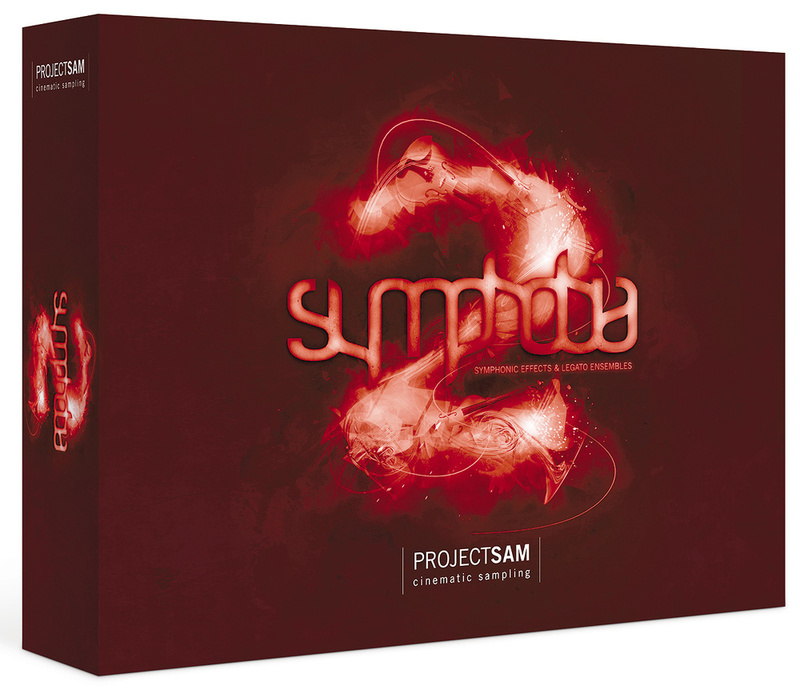 Its musical effects and processed soundscapes are also unrivalled by any other orchestral collection, which means that the only real alternative to Symphobia 2 is the original Symphobia. Strings, brass & woodwinds (oct). Violins, violas & French horns (leg). Cellos & solo bassoon (leg). First & second violins (oct, leg). Cellos & basses (oct, leg). French horns & trombones (leg). Two flutes & solo piccolo (oct). Two flutes & solo clarinet (leg). Bass clarinet & contrabassoon (oct, leg). Instruments are played in unison unless stated otherwise. (oct) = played in octaves. (leg) = includes legato sustains. * Marcato short notes only. ** Ponticello tremolo only. PC: Pentium or Athlon 1.4GHZ processor with Windows XP (SP2)/Vista/Windows 7. Mac: Intel Core Duo 1.66GHz processor with OS 10.5 or higher. Both platforms: 1GB of RAM, 20GB of free disk space. After installation, the library can be activated by entering its serial number at Native Instruments' Service Centre web page. It's also advisable (though not obligatory) to register it with Project SAM, in order to take advantage of any free bonus content they might offer in future, and/or access technical support, should you need it. Great, strongly played orchestral ensembles, solo instruments and effects. Features pre‑orchestrated mixed‑instrument sections and tutti samples not found elsewhere. 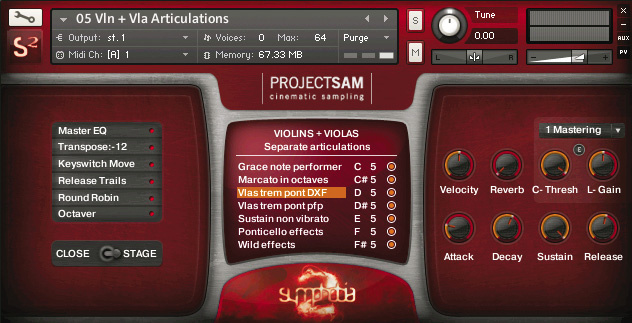 Like its predecessor, Symphobia 2 takes some of the slog out of creating sampled orchestrations. Full, ready‑to‑play sections provide instant colour and drama, the musical effects are great and the sheer force of the loud deliveries enables them to hold their own against the heaviest backing. Though there are gaps in its instrumentation and articulations, this is a top-quality, highly effective and versatile collection that is guaranteed to liven up your scores. Steptime Ware +1 360 676 1980.